When setting up a shielded room for full compliance with EMI specifications, it is often discovered that there are incidental items which are needed, but which have not been considered in the overall planning. Some of these items are indicated on the catalog pages under the subheading USEFUL ACCESSORIES. This page details other items which have a useful purpose in any well-managed test facility. A 50 W, 1 Ω resistor used in Test Method RS01 to measure the current in the Solar Type 7429-1 Radiating Loop Antenna. 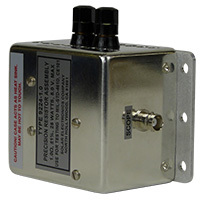 This device is mounted in a special housing with terminals for a voltmeter. 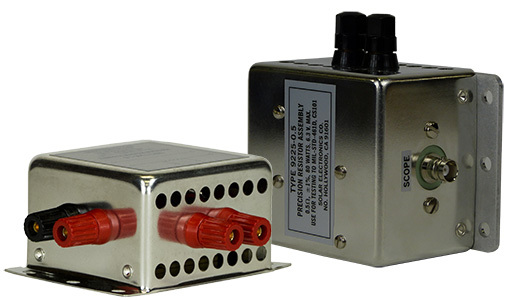 Since the resistance value is 1 Ω plus or minus 5%, the voltage measured on these terminals is equal to the current flowing in the circuit, up to 100 kHz. A 50 W, 10 Ω resistor used in Test Method RS02, Notice 3, U.S. Army version of MIL-STD-462 and Test Method CS09, Notice 4, U.S. Navy version of MIL-STD-462. 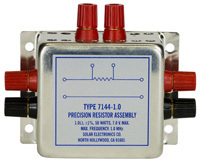 This resistor can be used where 'R' is designated in Figure CS09-1 with a voltmeter connected across it to determine the required 1 A of current. 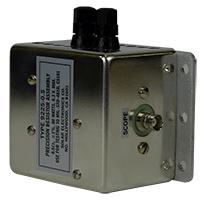 Useful, because it can cover the required frequency range and can be used up to 300 kHz. Most EMI current probes are deficient at the low end of the range.